I like to joke that if you know me, you’re two degrees away from many of our greatest pop stars. Bono? I’ve profiled his production manager, the guy who gets him and the group to all the gigs no matter where. Lady Gaga? The Rolling Stones? Kenny Chesney? Same thing. I recently had the honor of profiling Bruce Springsteen’s right hand man, George Travis in an article for FOH Magazine. I’m humbled by the many great people I get to meet from my humble home in St. Louis, but George was someone special among an industry filled with amazing, talented, and crazy people. At first he was hesitant to work with me on this article, being in the habit of shunning the spotlight for the 35 years he’s been doing what he does (he’s also worked with Ringo Star, Shania Twain, Boston — even Elvis). In the end I “charmed” him such as I do, and it allowed me to do an even better job. It became a journey, one where I feel I came out of it a better person for exploring this remarkable life. 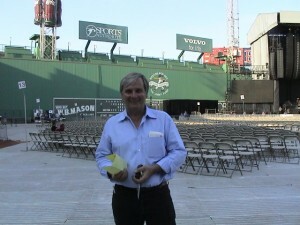 George at Fenway stadium getting ready for a show. As I like to say, my articles profiling people like this are only as good as the people themselves. This one turned out well, and it’s because I really came to love the subject and worked a bit harder on it than I even usually do. Out of it came a video that I wrote, and that turned out well, too. NAMM also has a piece on George that they filled at the Parnelli Awards, which I produce. This entry was posted in General and tagged Bruce Springsteen, concert writer, live events, St. Louis Freelance Writer, the Parnelli Awards. Bookmark the permalink.